Prior to cell phones, I always hated it when the phone rang just as my hand was on the door handle to depart. Now, I found a new way to prolong the agony of separation and temptation… I looked at my email before heading to work and found a message from a friend – Want Bees? The message was from Sandy, a very smart friend who knows wildlife. Better than most people, she could identify honey bees. 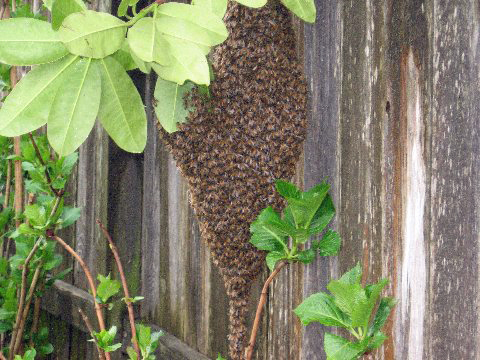 We’ve heard horror stories of beekeepers being called into rescue a swarm and facing wasps or other insects instead. Swarm of bees. photo by Sandy E.
In addition, Sandy did the most efficient thing and sent a photo of the swarm with her message. Well, the obvious answer was Yes! I’m all about promoting DNA diversity. 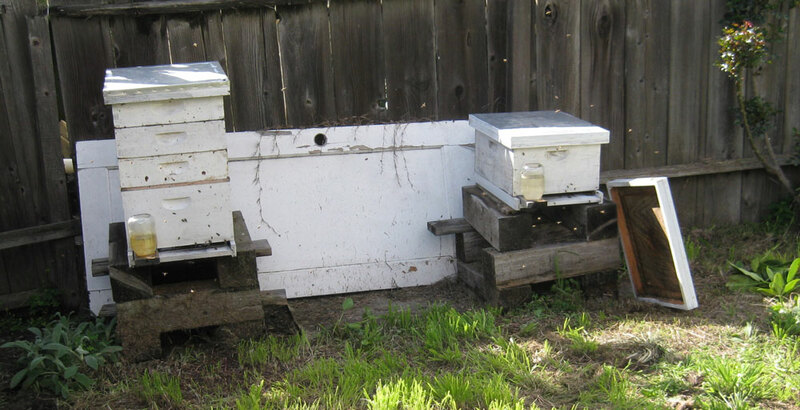 There’s nothing like an influx of wild bees to promote the health of honey bees. The only problem was, I was due at work in 15 minutes. Swarms are unpredictable. They may stay in one place for a few days and then fly to a newly found home, or they may depart within the hour. So, I did the next best thing to collecting them myself. I sent my partner, the Bee Man. The photo made this swarm look accessible and I crossed my fingers that he could get the bees without any complication. A typical problem with capturing bee swarms is that the bees don’t choose where they swarm to accommodate humans. Often the swarms gather in inconvenient places, up high in the air, or inside buildings or on branches that are difficult to get to. Often capturing a swarm requires two people (or more). Usually Jeff cuts the branch the swarm is on and I catch the bees in the super. But this time he was on his own. 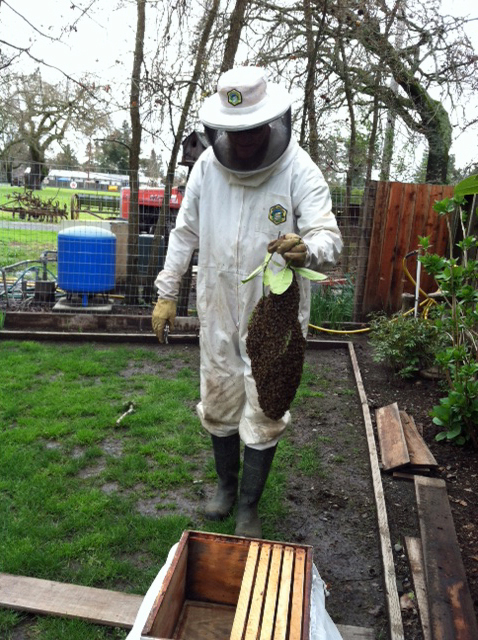 While I went to work, Jeff packed up a super, a large net and his bee suit and drove off to rescue the bees. Jeff carrying swarm. photo by Sandy E.
Fortunately he was able to cut the branch and lay the swarm in a super with a few frames. He waited and watched the bees. From their activity, he was sure that the queen was in the super. He wrapped the entire super up in a net and put that in the car and drove home. Once home, he place the super on a hive body, removed the net and shook the super. Between rain storms and wind, the bees have been foraging and returning to the hive body. They seem to have settled in. 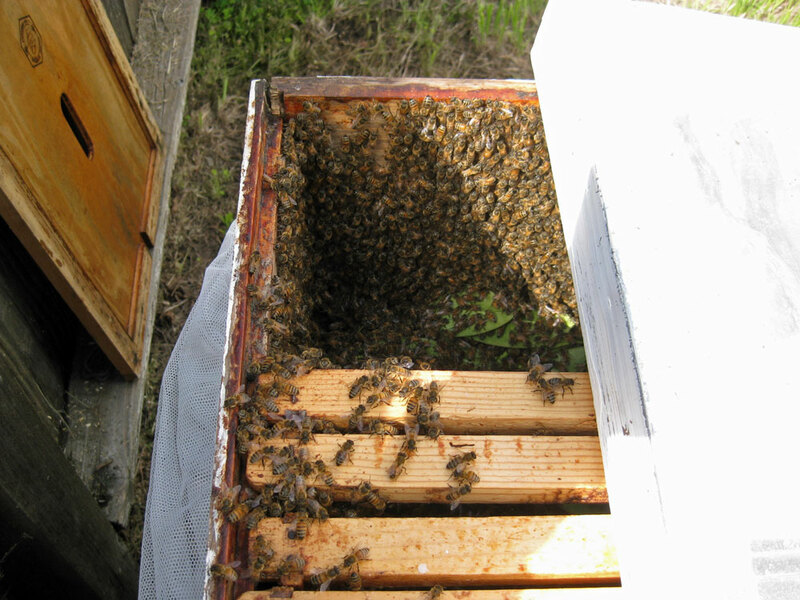 This entry was posted in Bees and Honey and tagged beekeeping, bees, Lanora Cox. Bookmark the permalink.